At the start of 2017, our Matters layout navigation was icon based. While the layout was clean and orderly, it lacked depth of supporting Matter Detail, necessary for achieving the highest benefit from utilizing the software for law practice matter management. Additionally, we found that icon navigation learning slowed down the new beta user, which ran counter to our goals of efficiency, clarity, and usability. In May 2017, based on feedback from beta firms and other attorneys, we revamped the Matter user interface for greater efficiency, clarity, and ease of use. You’ll see below the new links to content areas in the Navigation Bar (Associated People, Associated Time Cards, Documents, and Notes) where previously image icons had been located. 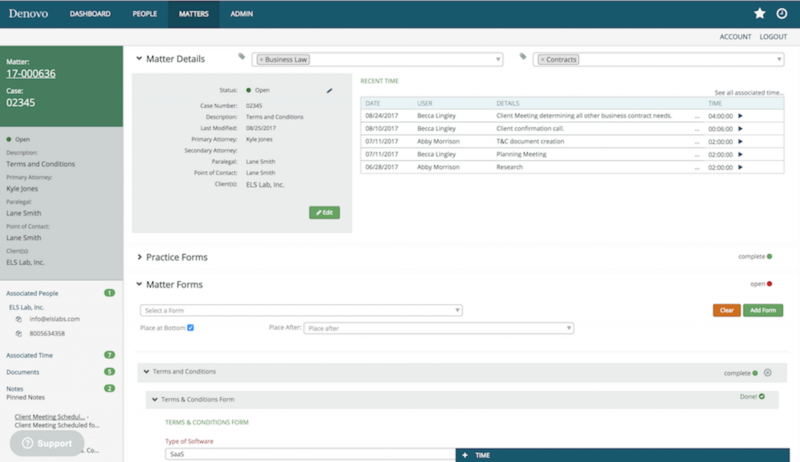 Clicking on the Matter Number returns the User to the currently displayed Matter Details, Practice Forms, and Matter Forms content areas, providing orderly form-based data collection to support Denovo’s document automation. 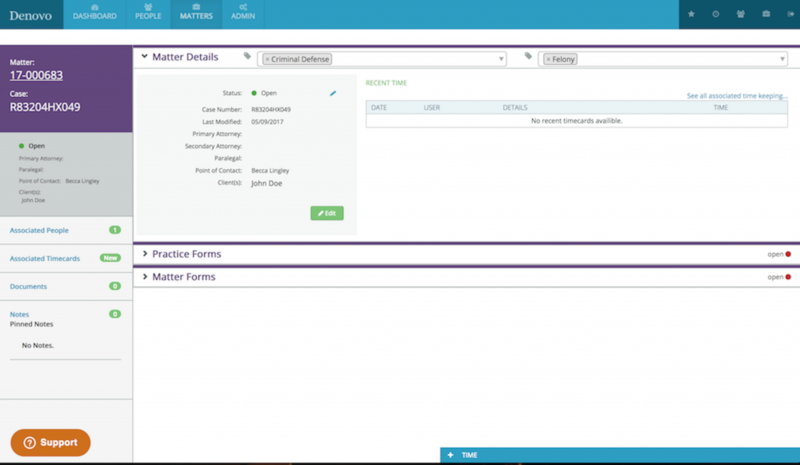 Our beta firms and beta attorneys used the new Matter user interface and provided feedback. Based on their feedback, we made a few more revisions to achieve even greater efficiency, clarity, and usability. The present Matter layout was released in July 2017. Now, a Matter Description field has been included, and Matter Details are clearly displayed in a larger text for quick reference on the Navigation Bar. Additionally, Associated People now display on the navigation bar with quick copy links for Email and Phone, supporting efficiency in using that information outside of Denovo via the user’s device/laptop paste functionality. Denovo is building user-friendly and efficient practice management software that directly improves firm efficiency, data organization and accessibility, time management, and customer satisfaction for our customers. Denovo, founded by attorneys, is built for busy solo attorneys, small law practices, and multi-location law firms who need effective practice management, time tracking, accessibility to their data on the go from anywhere, the simplicity of preferred browser access (Google Chrome, Firefox, Safari, etc), and want to avoid the headache of trying to maintain on-site server or IT elements. To learn more about Denovo and stay up to date on our development and upcoming launch, email us at info@denovo.io, sign up to receive our updates, or follow us on Facebook or Twitter.